Strong acceleration, balanced and stable with an appealing new look. This 2013 Hyundai Genesis Coupe is better than ever. 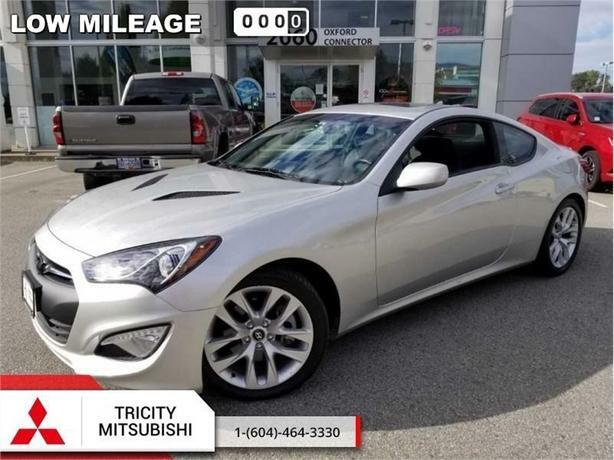 This 2013 Hyundai Genesis Coupe is fresh on our lot in Port Coquitlam. Since its introduction, the Hyundai Genesis Coupe has received high praise for its bang-for-the-buck proposition. Three years later, that bang gets bigger with the pumped-up 2013 Hyundai Genesis Coupe. This year brings a mild styling refresh for the front end and taillights, but the big news is under the hood. A new eight-speed automatic transmission with paddle shifters also debuts, bringing with it crisper acceleration and better fuel economy than last year's six-speed auto.This low mileage coupe has just 48677 kms. It's grey in colour. It has a 6 speed auto transmission and is powered by a 274HP 2.0L 4 Cylinder Engine.